If you do not have the keys to your new home, or is in transit and not sure what to do with their furniture and belongings, do not worry, Mudanzas Egara offer furniture storage service..
A secure, our facilities are fully equipped to deposit their belongings. We dispose of perfectly conditioned stores with individual wooden containers. 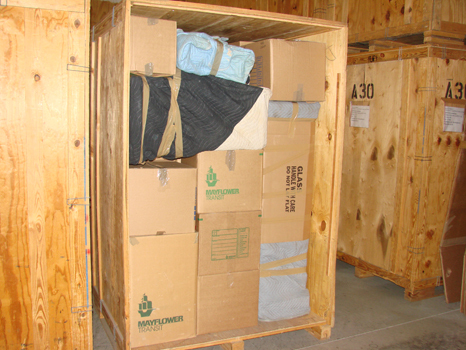 Here, we can store your furniture and personal effects in a dry and dust free place. It’s important to mention that, before the storage, a contract is to be signed by the company and the client, where your and our rights are stipulated. After filling the containers, these are closed airtight in presence of the client. No other hand will touch this container, until the client asks us to do so. When this happens, the same process is repeated on the inverse; the container is opened in presence of the client. This way in Mudanzas Egaraa we guarantee a minimum manipulation of your furniture, and therefore assure its conservation and security. The facilities for storage are protected 24 hours a day by security personnel.